Five frogs were sitting on a log. Four decided to jump off. How many are left? Why? Because deciding and doing are not the same. It always seems impossible until it’s done. Cut the crap and just do it. Life is what you make of it. Because in the end, the worst regrets are of those experiences which did not even happen, because you made an excuse. Let go of people who hold you back. Give yourself a chance to explore your talents. 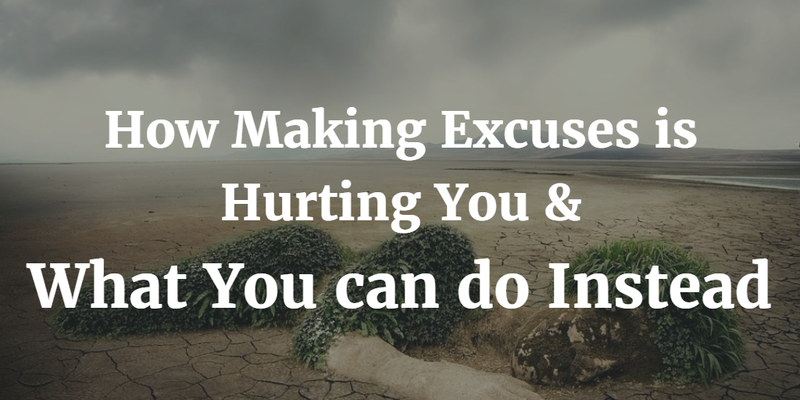 Why do we make excuses in the first place? Whether you think you can, or you think you can’t–you’re right. Why do we lie to ourselves? Why are we lazy to experiment with our capabilities? Why are we scared to fail? Fear of embarrassment, fear of rejection or fear of uncertainty? Or are we scared of change? Ask yourself these questions and get some answers. Once you start asking the right questions you find the right answers. You need to know yourself- your fears, insecurities, and flaws. You need to know at what point you are the most under-confident about yourself so that you rise above all fears and achieve self-confidence. Your life isn’t a race. The only person you need to be competing with is yourself. Compare your present you to your past you. Keep motivating yourself. Appreciating and noting someone’s good points is fine, but comparing yourself to them just makes you want to be like them. You feel bad about yourself- it brings you down emotionally and immobilizes you mentally. The basis of comparison may not be fair since we all come from different backgrounds, we all have different experiences, and we all see things differently. Recognize what you have and appreciate what the others have. You can’t spend your whole life cribbing about that one mishappening of your past. Having a positive outlook is necessary. Every bad experience teaches you a thing or two, so focus on that rather than feeling sorry about it. So what if you were not appreciated for your work before? That should not be enough to stop you from trying again. No hard work goes unrewarded. Stop allowing your yesterday to ruin your today. Accept what has happened. See every day as a new challenge, a new chapter. Human beings are one of the weirdest species. We want others to do everything for us. We seek help, advice, etc. And instead of getting up by ourselves each time we fall; we wait for others to pick us up by hand. And then we blame everyone or everything else instead of ourselves for our own actions. It doesn’t work like that in the jungle..
A single lion has a success rate of 15% on any given hunt. And lions hunting in pairs and groups have a success rate of just 30%. A lion when hungry doesn’t wait for others to join him on the hunt; neither has he waited for permission. He aims the neck and goes in for the kill! Lions do not stop hunting after missing a prey nor do they play the blame game. Get closer to your animal instinct and do whatever it takes to get your next client. Or a date with that girl you have a crush on. Don’t wait for the right time. Your prey won’t fall into your mouth you have to go out there each time you miss one. It has been said often that it is doing one more rep that truly makes the difference. Roll your sleeves and get your hands dirty. Risk messing up. Failing is not a problem you will face. 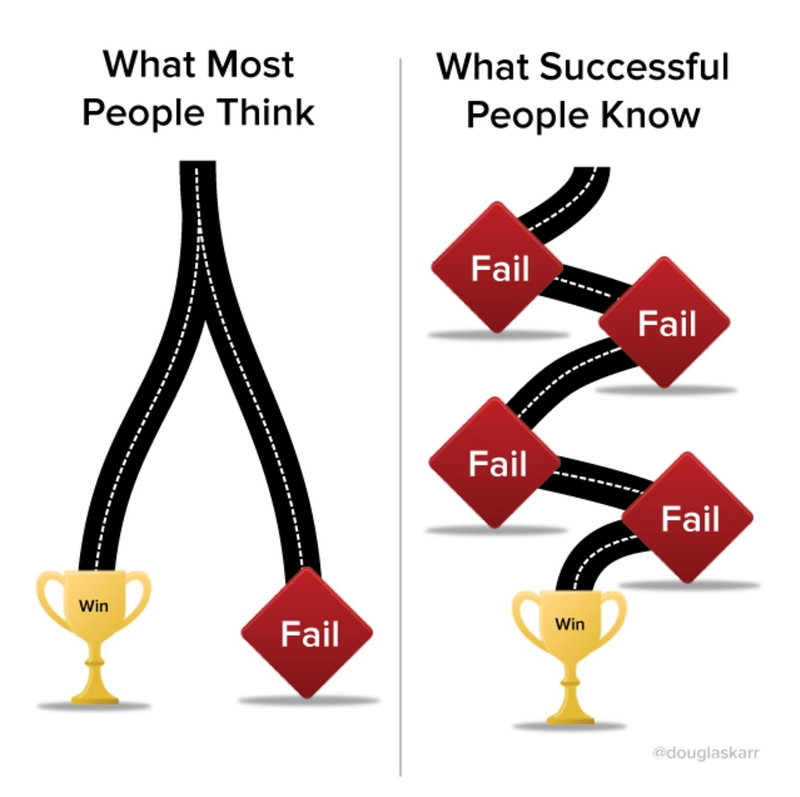 Failing is how you get there. Life is not built upon luck or fortune, but rather on our ability to successfully adapt to the changing conditions that life throws our way. Admit your mistakes, take full ownership of them. You’d learn to make better judgments and keep little problems from growing into big ones. A mistake is a price you pay for getting educated. Work by trial and error and focus on your strengths and use your weaknesses to better yourself. Seek alternate perspectives ask other people for their opinions, comments, and feedback. Stop saying I won’t, I can’t, I’ll do it later, I’ll try, I may do it, tomorrow, day after.. NO! DO IT NOW! If you want to get from where you are in life to where you want to be, you need to avoid making excuses and focus on the tasks that are going to get you there. You can either make a 100 excuses as to why you can’t do it or one excuse as to why you have to do it. The choice is yours! You can either make money or an excuse. You either lift that dumbbell or cry like sissies over calluses. Things that are stopping you are mirages. Take responsibility and deal with them. A writer frames a whole article with just a concept in his head. Bring your ideas to life and create your own story. If you don’t have an end in mind you might get lost in between. You can either hunt – become a predator or you can be a coyote…sit, relax and eat carcasses. Unlike animals we humans have a distinct advantage, we can mold ourselves into whatever we want to become. Have a goal. Have a plan. Have difficult targets. It’s okay if you fail. But it is not okay to give up because you failed once. Stop trying to find reasons for not doing something. Excuses are the reasons which keep you in your comfort zone forever. Life is an adventure. Live like it. Get obsessed, totally obsessed. There is no just liking what you do, get obsessed with it. Stand up and do what you want! Don’t be lazy! Don’t hesitate! Don’t let excuses stop you from achieving your goals! One of the most fascinating qualities of animals is their ability to focus on their prey. Be it a tiger, lion or an eagle. Don’t kill yourself over multitasking. Don’t talk on the phone while driving the car, don’t post a picture on Snapchat while in a meeting. Narrow your sight and energy to the most important thing at hand – for securing food and for survival. Remain in the moment and increase your productivity. I’d highly recommend you add The One Thing to your library; it’s a keeper.